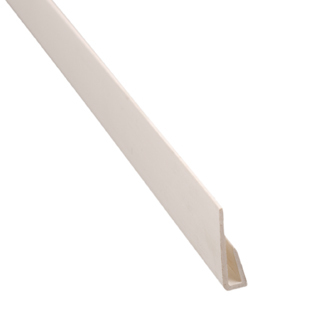 A Capping Strip can be used to give the top and bottom of the PVC cladding panels a clean and professional finish when there is no coving or skirting present. The Ariel PVC Cladding range offers solid PVC and foam PVC cladding sheet, both a versatile material with a high strength to weight ratio that can be easily worked with, using the standard tools used for plastics, wood and metal. It may be thermoformed to fit in and around corners, though accessories for internal and external corners are available to use as well. The smooth, yet hardwearing surface is easy to clean using non-abrasive cleaning agents. The recommended adhesive for installing PVC Cladding sheet is polyurethane (PU) as it can set in high moisture conditions and has a work time of approximately 45 minutes (temperature dependant) before it cures, allowing time to adjust the panels. Alternatively modified silicon (MS) can be used. If in doubt, it is recommended to test a small part before starting with the installation. A full range of cladding profile accessories is available to achieve the required finish when installing the PVC cladding range. Full details are available in the Accessories section. As a guide the text on branded protective film should always be the same way up. Where the protective film is unprinted, the same end of every sheet on a pallet or bundle should be fitted at floor level. Please contact our Technical Department who will be happy to advise on installation instructions for the PVC Cladding range. Remove protective film after installation and use anti-static cleaner or warm soapy water to clean the surface. DO NOT use glass cleaner, abrasives or squeegees; always use soft cloths or antistatic wipes to wipe down dust.